Hugh Jackman returns to the musical after Australia and Les Miserables with The Greatest Showman, an uplifting if contrived film loosely based on the life of P.T. Barnum. It marks the directorial debut of Michael Gracey from a script written by Jenny Bicks and Bill Condon. 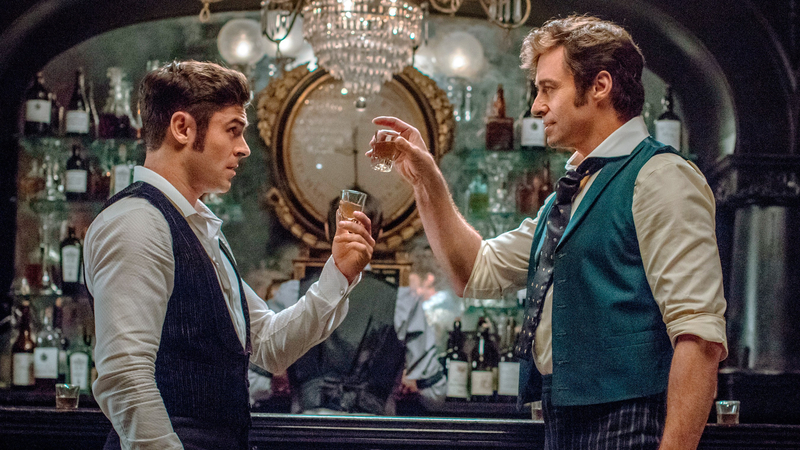 Jackman slots into the role of Barnum perfectly, aided by a terrific supporting cast which includes Michelle Williams, Zac Efron and Zendaya. The film is an extravaganza, with excellent choreography and toe-tapping songs that range from the emotional to the straight-up toe-tapping. As a young kid, Barnum is looked down on. His father doesn’t earn much and he’s cast aside by the community as a dreamer that won’t amount to anything. When his father dies, he signs up to work on the railroads, eventually marrying the woman of his dreams, Charity (Williams), and having two children. But the work is never consistent. And so he takes out a loan using sneaky tactics and decides to open a circus, taking a chance on the eccentric locals who’ve also been ostracised from the community. It’s hard work, but what he builds is a place of safety and happiness. But all of that is threatened by Barnum’s desire for wealth and prosperity. All of that might sound familiar – and it is. The film doesn’t pride itself on dramatics or originality in terms of story, instead choosing to excel in other areas. Jackman forever has a twinkle in his eye, even when the film touches upon theme of the overwhelming desire for more and envy Charity feels when Barnum becomes besotted by singer Jenny Lind, risking his family and respect in the process. This twinkle is a reassurance to audiences that this is more of a rose-tinted version of reality. In its favour, however, The Greatest Showman really does deliver on the theatrics and wide-eyed buoyancy of a man fulfilling his dreams and rising above his class. It’s an undeniably infatuating piece of escapism that celebrates the uncelebrated and offers songs that will be hummed to death for weeks after the film has finished in the process. Jackman has always been a showman of sorts, and there’s arguably no one better that could have played this version of Barnum. Williams is also excellent as Charity, though the character isn’t as well fleshed-out as she could have been. But it’s perhaps the assortment of talent that make up the cast of the circus who prove to be the real stars of the show. Zendaya also continues to impress after her recent role in Spider-Man: Homecoming, sharing much of her screen time with Efron, who revisits the musical after High School Musical launched him into the stratosphere. The set designs and costumes are impressive to say the least. At times it really does feel as though you’re in the circus watching these people fight for their right to have a worthy place in the world and bring joy to others in their own individual ways. One song in particular, This Is Me, represents all the film is about and should receive some love during awards season. The Greatest Showman may not delve very deep or motivate deep and meaningful conversation, but it’s a show well done – one that boasts a wonderful cast, memorable songs and rousing set pieces that will, for the most part, excuse its pitfalls.